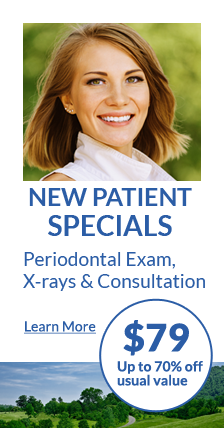 Once a patient has been treated for periodontal disease, there are a couple of benefits for them if they return on a regular basis. One is, since there are no symptoms with this disease, somebody has to thoroughly examine to make sure the disease is not active again. This examination is rather sophisticated and a lot of data is accumulated. We will do this for our patients twice a year. We find that it has tremendous value. I’ve treated patients well over 20 years ago that have never required retreatment and it’s because of the thoroughness of this reassessment. The second value is that none of my patients are perfect – I know I’m not perfect – and our lives and the stresses of life easily sneak back into our days and it’s very easy, when you have a disease with no symptoms, to perhaps lose some of the momentum you had when you first started treatment. Our team will have the relationship with you and we can coach you back into effective daily habits in a way that you’ll appreciate it rather than feel judged.